After trailing 19-3, the Philadelphia Eagles came back to defeat the New York Giants 25-22 at Lincoln Financial Field in Philadelphia, Pennsylvania on Sunday afternoon. With the loss, the Giants fell to 3-8 overall on the season. 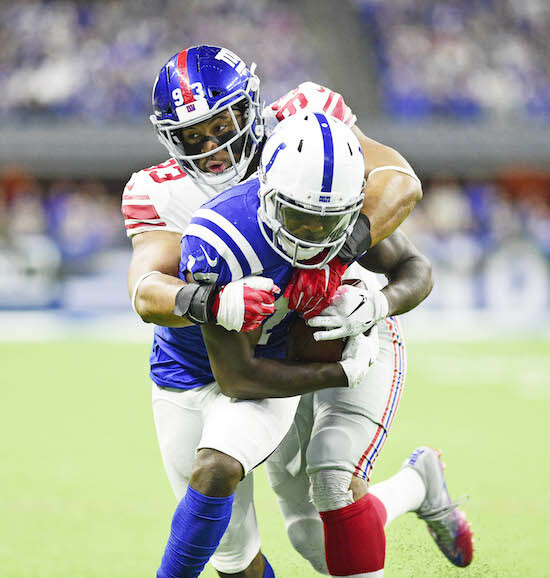 The Giants received the football to start the game and put together an impressive 9-play, 75-yard opening drive that ended with a 13-yard touchdown pass from quarterback Eli Manning to running back Saquon Barkley. The Eagles were flagged with a penalty on the touchdown and Head Coach Pat Shurmur decided to go for the 2-point conversion, which failed. The Giants led 6-0. The Eagles picked up one first down on their first drive, but punted. 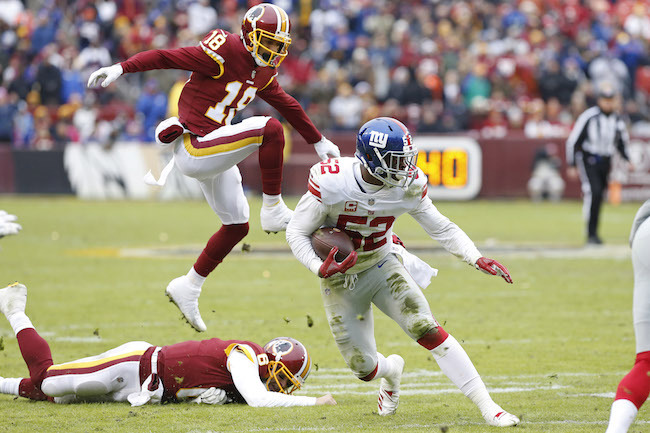 The Giants then drove 87 yards in 10 plays, but could get no closer than the 7-yard yard line and settled for a 25-yard field goal by place kicker Aldrick Rosas. The Giants now led 9-0. The Eagles picked up one first down on their second drive, but once more were forced to punt. 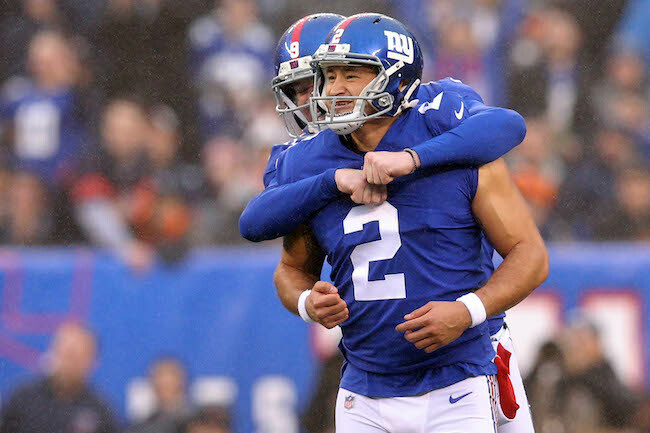 Again the Giants responded with points as New York drove 54 yards in 10 plays to set up a 51-yard field goal by Rosas. Giants 12 – Eagles 0. Philadelphia finally got on the board on their third possession as they moved the ball 46 yards in seven plays to set up a 42-yard field goal. 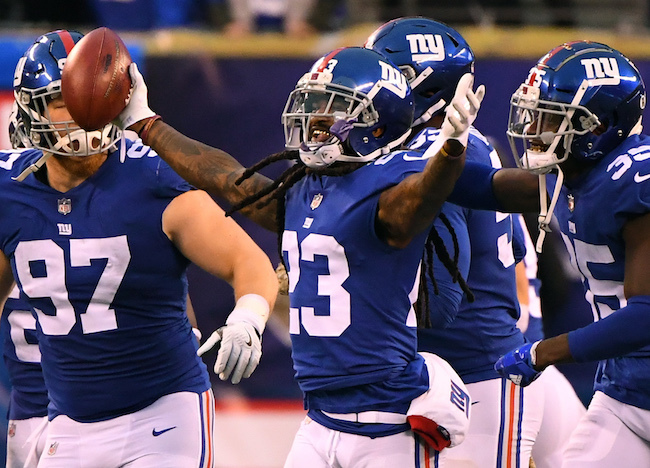 The Giants quickly charged back with tight end Rhett Ellison gaining 20 yards on a reception, Barkley picking up four yards, and then Barkley breaking off a spectacular 51-yard touchdown run. With just over four minutes to go before the half, the Giants led 19-3. The final four minutes of the half proved critical however. First, the Eagles scored a touchdown quickly by driving 75 yards in six plays, with the possession culminating with a 15-yard touchdown pass from quarterback Carson Wentz to tight end Zach Ertz. The Eagles also converted the 2-point conversion to cut the Giants lead to 19-11. 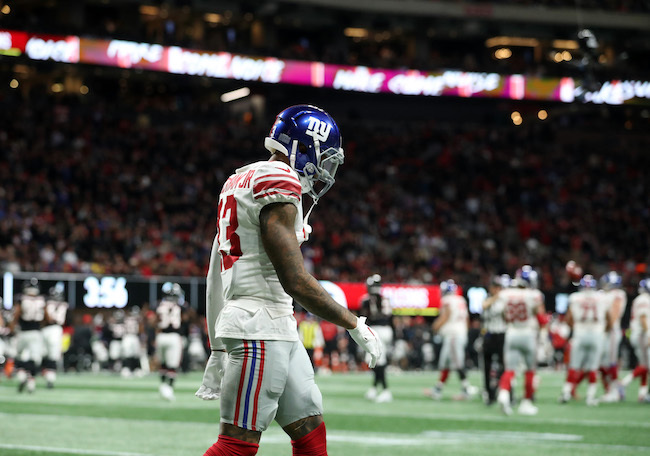 The Giants then wasted a 46-yard kickoff return by wideout Corey Coleman when Manning foolishly threw to a well-covered wide receiver Odell Beckham at the Eagles 2-yard line. The pass was picked off, ending the scoring threat, and the chance for at least another field goal. The third quarter began with both teams exchanging punts but the Eagles winning the field position battle in the exchange. Philadelphia began their second drive of the half in Giants’ territory, which led to a 29-yard field goal. Giants 19 – Eagles 14. 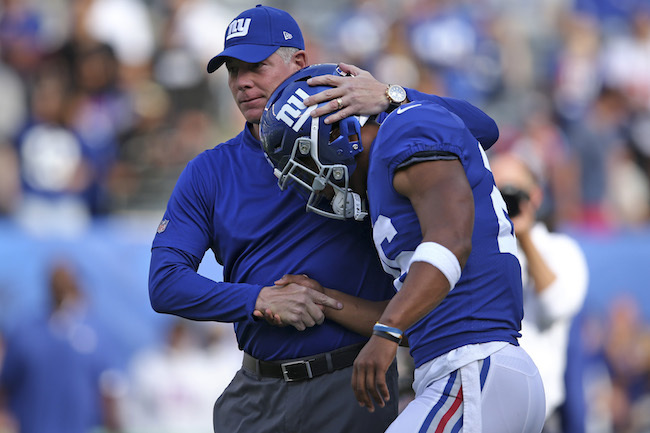 After Barkley gained 94 yards rushing and 37 yards receiving with two touchdowns in the first half, the Giants inexplicably went away from calling his number. Barkley only carried the ball four times in the second half of the game, and caught one more pass. 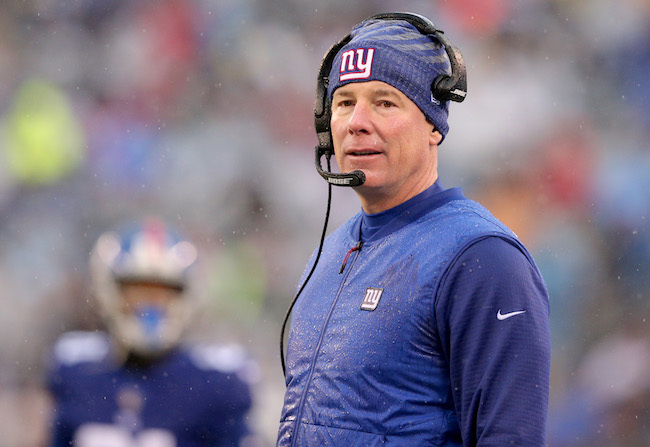 Not surprisingly, the Giants punted again on their next two possessions.. 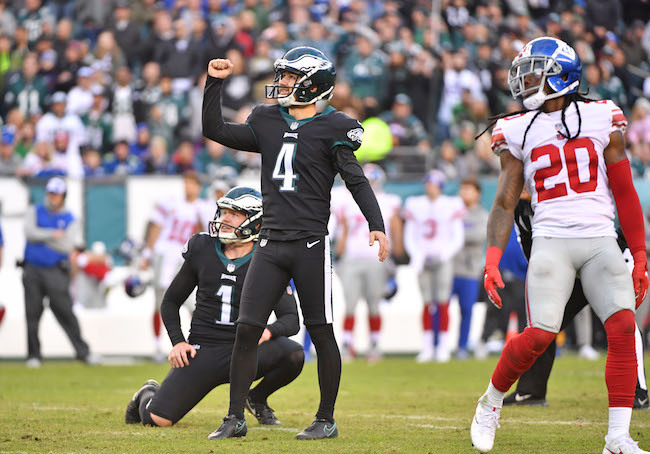 The Eagles went ahead in the 4th quarter on a 7-play, 61-yard drive that ended with a 1-yard touchdown run and another successful 2-point conversion. Philadelphia now led 22-19 with 10 minutes left in the game. New York finally scored their first (but unfortunately only) points of the second half by responding with an 8-play, 56-yard drive that ended with a 29-yard field goal. With 5:49 left, the game was tied 22-22. The ensuing game-winning drive by the Eagles was predictable. Philadelphia drove 50 yards in 10 plays, eating 5:27 off of the clock. The defense had a chance to stop them on 4th-and-1, but the Eagles easily converted with a 12-yard pass completion over the middle. The Eagles kicked the game-winning field goal with 22 seconds left on the clock. 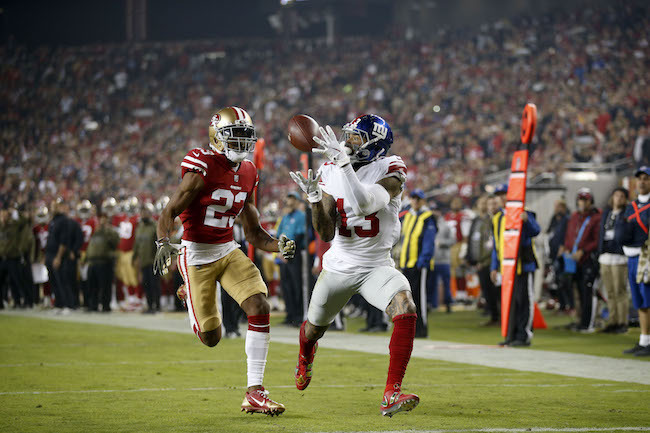 The last three plays by the Giants only resulted in seven yards. Game over. Manning finished 26-of-37 for 297 yards, one touchdown, and one interception. His leading targets were Barkley (7 catches for 41 yards and one touchdown) and Beckham (5 catches for 85 yards). Barkley gained 101 rushing yards and one touchdown on 13 carries. Defensively, the Giants did not force a turnover. They did have three sacks, with one each by linebacker Alec Ogletree, linebacker Tae Davis, and defensive lineman Mario Edwards. Inactive for the New York Giants were defensive end Kerry Wynn (concussion), quarterback Kyle Lauletta, wide receiver Jawill Davis, center Evan Brown, nose tackle John Jenkins, cornerback Tony Lippett, and safety Kamrin Moore. 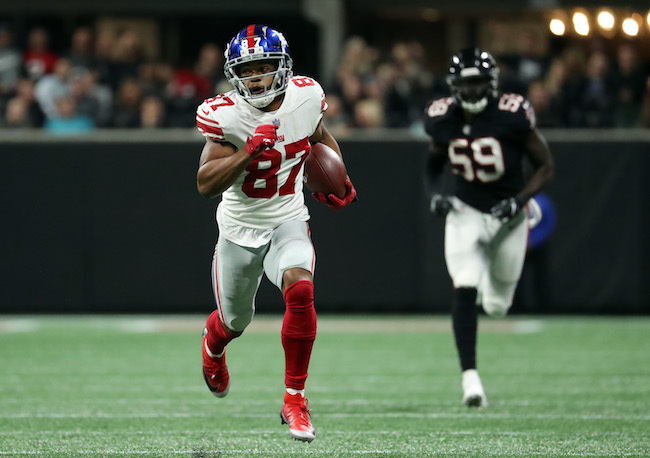 Tight end Evan Engram injured his hamstring during pre-game warm-ups and did not play. Wide receiver/returner Quadree Henderson left the game with a fractured shoulder and did not return.